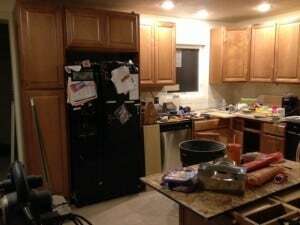 Starting on Friday, 4/18, I’m going to attempt to remodel my kitchen in 5 days. With some luck, beer and a lot of hard work, I’ll complete it by 4/22, end of day. Each evening, I’ll document my progress. 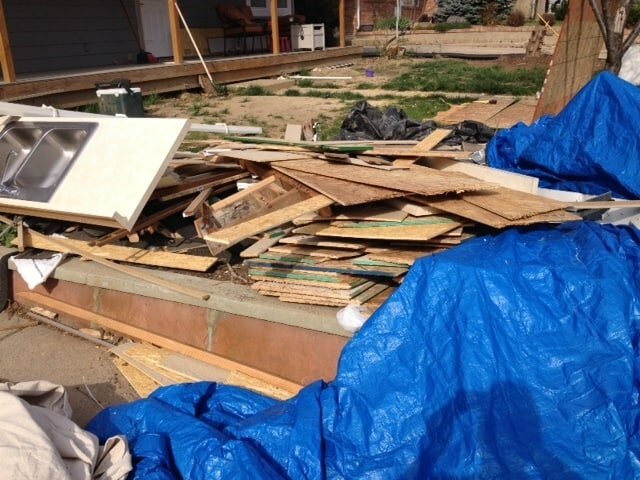 Here is update #4 (4/21/2014). Scraping up the old mastic is a chore: Last week, we took some tiles off and they popped off super easy. Great! However, not all of the subsequent tiles gave in so easy. Many put up a very strong fight. We spent hours scraping the floors, getting the old junk off. The most important part of a good tile job is getting a solid foundation. The good news is that we’re ready to put tile down first thing tomorrow. Sorry neighbors. At least we’re not cooking meth. 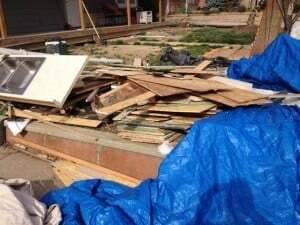 Our home is a mess of monumental proportions: Due to construction, our yard and garage have been humongous disasters for months (thanks you kind and understanding neighbors for not calling the village on us). We haven’t been able to park a vehicle in the garage in 2014. I cannot stand this. Messes mess with my mind. I lose my keys, wallet and phone constantly. My brain is frazzled. Not good. Enough. So today, we spent about 5 hours just cleaning up. I feel much better. Injuries today: 0 (1 total) My thunb still hurts from the “drill incident” the other night (drill + human flesh = not good), but nothing new. My fingers appreciate it. Beers consumed: 2 (total: 9) That’s it. No more beer after today. Prognosis: Meh. Tomorrow, I’ll get a lot of tile down, but still won’t be complete. Did I fail? Maybe. Who is this? Is she still alive (doubtful)? What do I do with this picture? Perhaps it will end up in a random neighbor’s mailbox. Please don’t rat me out to the USPS. This fun was supposed to go on for 5 days. I’ll have completed most of the work by end of day tomorrow, but not all. I’ll still have a bit of tile to finish up which will happen during the weekend because I have to go back to my 9-5. Some of you may be wondering why the hell I’m blabbing about hanging cabinets and laying tile. I assure you that it’s not to toot my own horn. I’ll have something to say about this tomorrow, so stay tuned*. *”Stay tuned?” Is that a dated saying or what? Who has to tune their TV or radio to receive a broadcast anymore? I wonder if anyone under the age of 30 even knows what on earth I’m talking about? Oooh, how I loathe scraping glue off of concrete, yet we’re going to have to do 1100sqft of scraping soon enough. I love that you found periodic table placemats. Your girls will have no excuses when they hit Chemistry class. My 2 favorites finds from our remodels are the receipt we found in our soffit that was for the original wood delivery to build our house (lots of 2x4s! and other framing materials). We have it and keep telling ourselves we’ll frame it and hang it because it’s pretty cool and original to the house. The other cool one was a steel penny that I found behind a crappy non-functioning dishwasher in our duplex about a week after we bought the place. The penny was in rough enough shape that I briefly thought it was a 1944 (and of course googled it and saw they were worth more than we had just paid for the duplex and got VERY excited). I briefly though we had just made the best investment ever! But with a little cleaning, I could make out the 1943 and now instead it’s worth just about $0.01. What a difference a year makes. I still have the penny. It’s pretty cool. Well, you will have a little extra to do this weekend. However, if you HADN’T set the 5-day deadline, it’s possible that you might have taken 10 weekends to finish the project. You have definitely plowed through this. Good luck crushing it on this last day! Scraping adhesive off of floors is a special kind of punishment. I figure we are paying penance for old sins with that job. The pure of heart can be identified easily: they outsource the job. Looking forward to hearing what the news is tomorrow. I’ll be back at the same Bat Time, same Bat Channel. Good stuff Mr 1500, just wanted to say I am really enjoying following along with the progress! JR recently posted…How Long Should You Wait to Increase Your Credit Limit? Looks like it’s coming along great! I like how you took the time to recess the refrigerator. I can tell it’s going to be really nice when it’s all finished. I have done a ton of kitchen remodels. If you change cabinets, go with RTA cabinets. Cheap, 100% wood, no particle board. 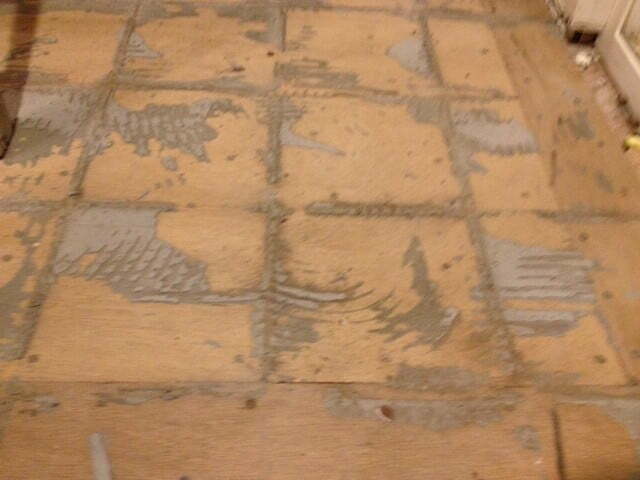 If you put down tile, just put 1/4″ cement board over the old floor, and lay the tiles. LOL at “at least we’re not cooking meth.” I definitely don’t envy that, I would be pretty frazzled, as well. But I’m definitely staying tuned! You go, 1500s! I love it. 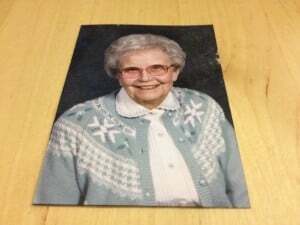 I think you should keep the picture of Aunt Mildred in your wallet. 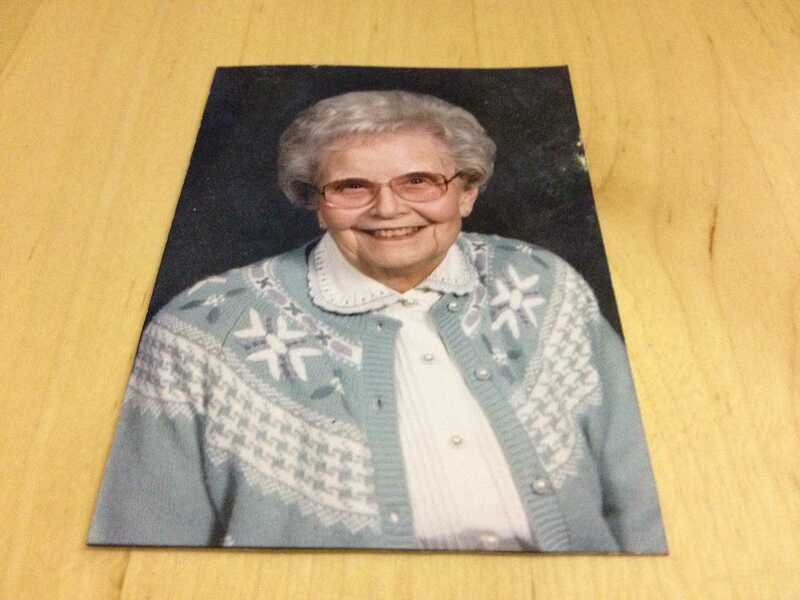 When you are chatting with an older neighbor, pull it out and say, “This is my mom. She is a great woman. Don’t you think?” They will go white, say she’s a dead ringer for neighbor who passed away and….oh, forget it. It sounded better before I started thinking – which is usually the case. Hope you had some good beers…highly recommending Go to IPA (Stone Brewery).